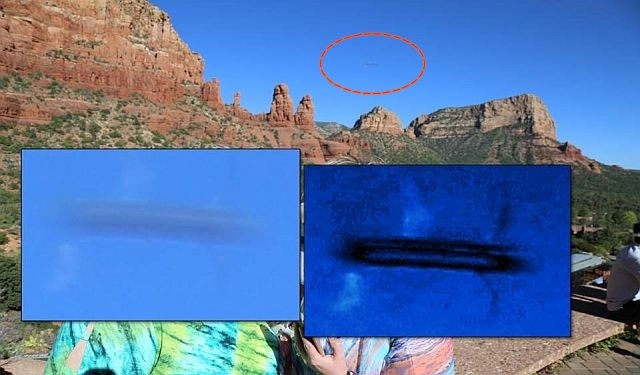 Case 1 – Unidentified rectangular object in the sky over Sedona, Arizona. On April 20, 2017 I was visiting the Chapel in Sedona, Arizona with my mother and sister and took several photos of both the chapel and the various views around. 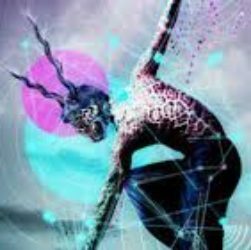 It was only after I returned home and viewed the photos on my home computer's 27 inch monitor that I notice in one of the frames that I was taking consecutive photos of my mother and sister that I notice an "object" in the background above the mountains in the sky. This object is only visible in the one frame and is not shown in the frame before and after in the series of photos that I had taken that afternoon. I did not witness anything in the sky with my naked eye nor do I think anyone else noticed anything as well. 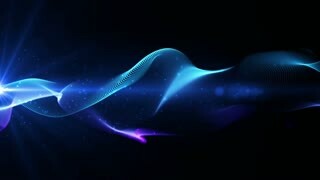 Mufon case 83489. Case 2 – Cigar-shaped UFO hovering over Brooklyn. 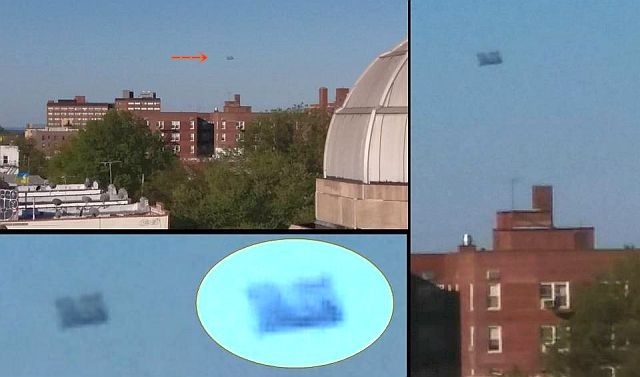 Witness: A very large size, gray color object hover without any noise over Brooklyn on May 3, 2017. I personally don't know what it could be. I had a good 15 minutes sharp view of the object. I was trying to be rational but find no answer, but the object was much larger than a Boeing CH-47 Chinook helicopter. Unfortunately the video footage doesn't give back the ratio of the object. 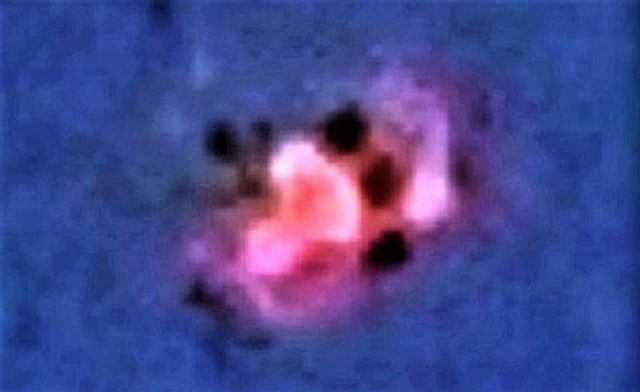 I have photos captured also and after zooming I saw the object have colors and lights. Mufon case 83501. 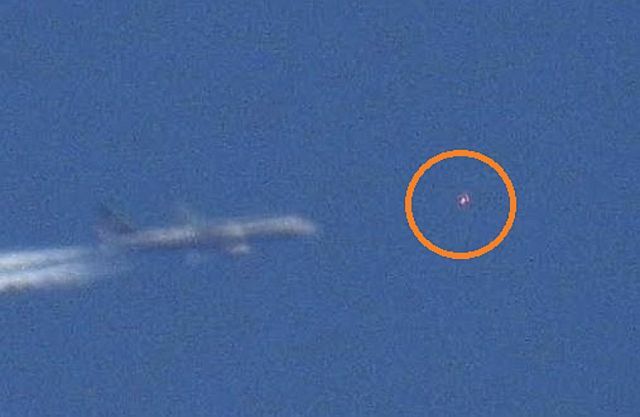 Case 3 – Violet colored UFO captured flying in front of a passenger plane. Witness John Mooner: I was sky watching when I spotted a passenger plane that was approaching. I started watching the passenger plane as it flew across the sky. I then started taking photographs of the plane with my Nikon P900 Camera. It was then I spotted an object that was directly in front of the passenger plane. 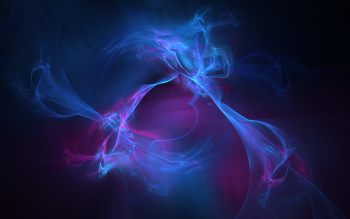 The object was a violet color and definitely had structure to it. 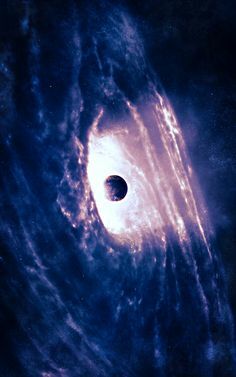 There appeared to be what at first I thought were round black windows on the object but I then realized that they were in fact individual black objects moving around the outside of the object. I quickly took a photograph and managed to capture the strange object right in front of the passenger plane. After taking the photograph I continued to watch as the unknown object matched the planes air speed and stayed in front of the passenger plane for a while before moving off and disappearing from sight. The passenger plane pilots must of seen this object through the cockpit window. The pilots made no attempt to change course or avoid the object that was directly in front of them. The pilots must of known or been told that the object would not collide or pose any threat to the plane. I only wish the pilots would come forward and tell the world what they witnessed up there. The photograph was taken on April 16, 2017 12:45 PM at Newton Abbot Devon England. Case 4 – Hiker captured second sun or celestial object? I went to hike at Alta ski resort in Utah, US with my wife. An incoming storm was coming and after returning to our car in the parking area the sky was covered in storm clouds high winds and snow started. A break appeared in clouds with the sun appearing in the edge. I saw a stationary brilliant blue image (blur) in the middle of the storm cloud deck and took out my cell phone (galaxy s6) to capture it thinking it was a sundog reflection on clouds. I shot the picture through the sunroof enlarged it and saw the blur was two orbs with similar lighter appendages. Next I stepped out of the car to look to see if it was due to the polarized sunroof, but it was not. It was still visible to the naked eye. The objects seem to have caused a shadow image in the sky some distance between itself and the camera. The orbs remained visible for about 45 minutes till the gap in the clouds covered it completely. The storm front was moving from west to east with wind gust to 50 mph a ground level these objects seemed unaffected by the storm and were stationary even though the wind was likely much greater at the altitude it was observed at. The image was taken last year on March 12, 2016. Mufon case 83502. 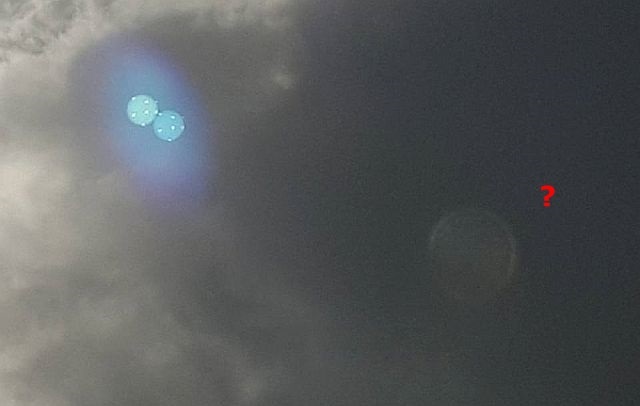 Editor’s note: Personally I think the two blue objects is lens flare, but what I'm wondering is the perfect round object next to the blue objects. 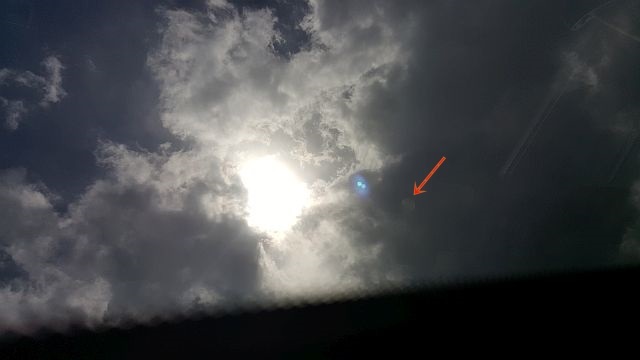 Just another lens flare or could it be something like a second sun or celestial object covered by the clouds?